Hard to believe that the first of the puppies leaves this weekend. Pups at this age are wonderful – smart, playful, developing their full personalities. Pups at this age are also trouble – they’ve become adventurous, which can lead to some fun situations, and a LOT of mess. Vela, Po and Jacques all venture out into the big world over the course of this weekend, off to learn how to be pets, rather than just members of a pack. 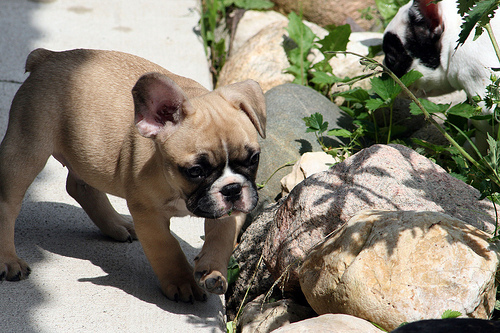 Fortunately, Frenchies as a breed are very people focused – there’s no such thing as a people shy Frenchie puppy, at least not one that I’ve ever known. The typical reaction of a Frenchie to new people is “Yay, someone else to pet me!”. Trust me, they don’t even look back as they go out the door – the teary eyes are all on our side. Bunny is quite ready for them to pack their bags and head on out – she’s had her fill of motherhood, and would like to get back to her place on the couch, thanks. Poor Bunny – she’s moulting again, just as she did with her last litter. Patches of her hair are thinned out and weedy looking. She looks moth eaten, and leaves clouds of white hair every where she goes. Sweeping the floor has become a game of trying to catch all the hair that floats around the room, without stirring up even more of it. After the cut there’s a slideshow of all the pups outdoors, doing fun Frenchie stuff. Bye puppies – we’ll miss you! https://i0.wp.com/www.bullmarketfrogs.com/wp-content/uploads/2015/04/Brindle_pied_frenchbulldog.jpg?fit=662%2C662&ssl=1 662 662 Carol http://www.bullmarketfrogs.com/wp-content/uploads/2015/06/bullmarket-logo.png Carol2009-08-13 11:00:012009-08-13 11:00:01Almost all grown up.. I can’t believe they’re ready to leave! Wow.. that just flew by. I don’t know how you manage to get all of those fabulous shots of the dogs.. it’s not easy to take a picture of one dog, let alone a whole bunch of wriggly, curious puppies! Good job!